Quality, Durability and Protection made easy! We have over 6000 types, sizes, and configurations. Large Selection of Ethernet, Data, Signal and Power. Manufactured using the highest grade Thermoplastics. 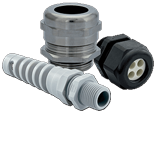 Strain Relief Fittings, Cord Grips, Cable Glands, Enclosures, Circular Connectors, Flexable Conduit, Hygienic Glands, Adapters, Reducers and Enlargers. Hazardous Locations Ex-e/Ex-d Oil & Gas and many more! Don't settle for less choose Sealcon quality.